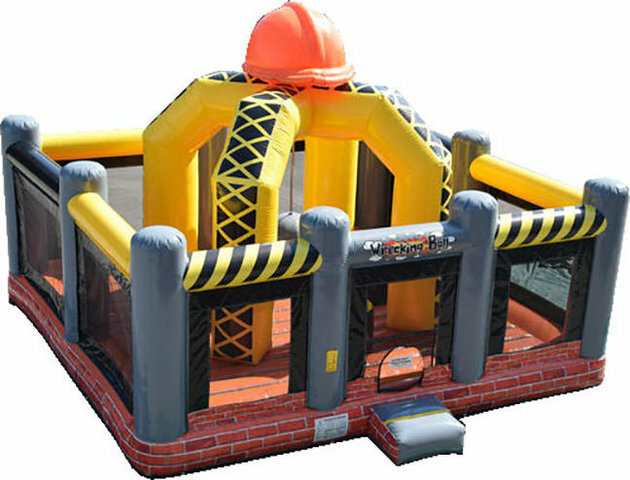 The Dallas Inflatable Human Wreking Ball Game Rental, also known as the Human Demolition Game is sure to be a smash hit at your next party or event. Dallas Inflatable Wrecking Ball Game allows up to 4 players to play at a time. Players stand on inflated pedastals and push the demolition ball at other players trying to knock them off their pedastals until their is only one player left standing. The Wrecking Ball Game is a high pace exciting game that all people at your event are sure to love! This massive inflatable will be the WOW Factor at your next field day, church event, post prom activity, or company picnic. Now who's ready to go demolish your opponents!